With the aging process it is very difficult to keep our face looking well rested and rejuvenated. Different HA filler are used to bring back the youthful appearance of the face. Many time different fillers are combined to achieve the best results. Here is a brief summary of what is available at Blue Med Center. JUVÉDERM® is a family of injectable hyaluronic acid dermal fillers used to provide 9 months to 2 years of correction for moderate to severe facial wrinkles and folds. JUVÉDERM® products are a smooth consistency gel, compared to some hyaluronic gel products that have a granular consistency. Juvederm products are developed using the Hylacross technology to allow a smoother, malleable gel. Hyaluronic acid is a naturally occurring sugar found in the body. Hyaluronic acid works by holding in water at the injection site and acting as a cushioning agent. It adds temporary volume and a smoother appearance to skin. 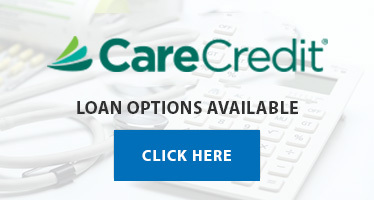 Most patients need one treatment to achieve optimal results. JUVÉDERM® XC injectable gel is for injection into the facial tissue for the correction of moderate facial wrinkles, folds, and volume loss in the lips (nasolabial folds, Lip augmentation, corners of the mouth, and marionette lines.). Lasts from 6 months to up to 1 year. 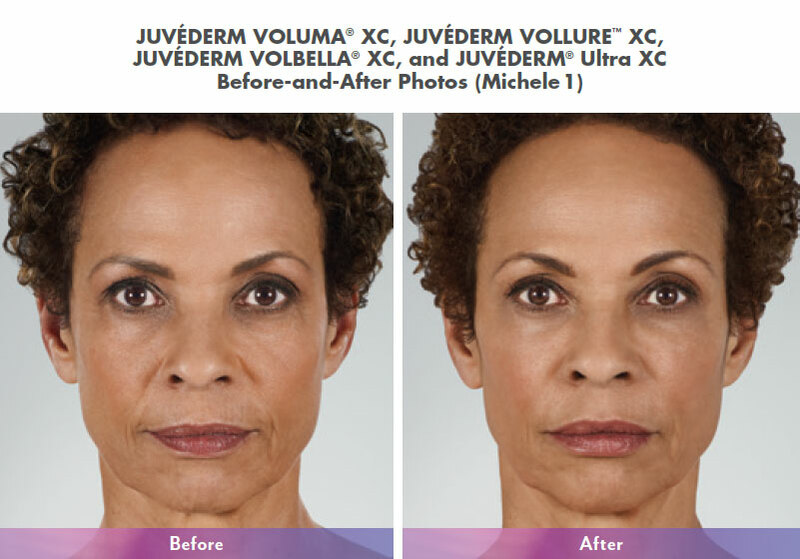 JUVÉDERM VOLLURE™ XC injectable gel is for injection into the facial tissue for the correction of moderate to severe facial wrinkles and folds such as Nasolabial folds and Lip Augmentation. JUVÉDERM VOLBELLA® XC injectable gel is for injection into the lips for minor lip augmentation and for correction of perioral lines. It gives a youth full fullness in the lips and Lasts up to 1 year. JUVÉDERM VOLUMA® XC injectable gel is for deep injection in the cheek area to correct age-related volume loss in the face. 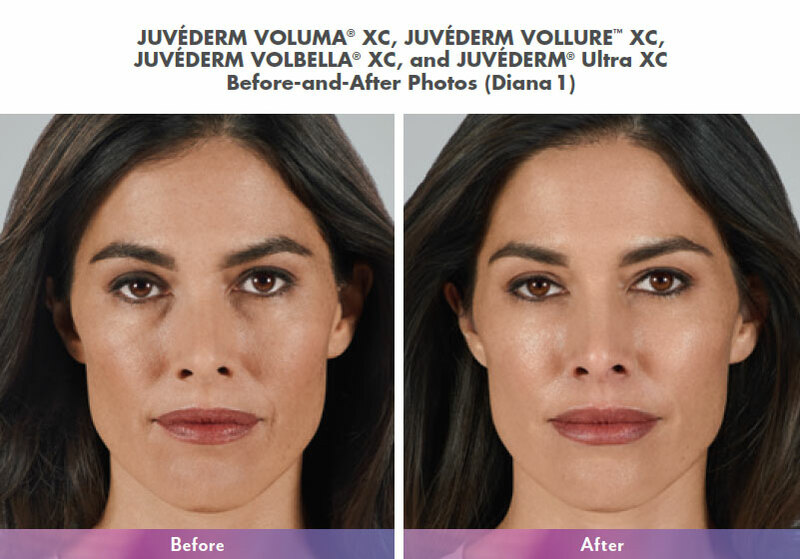 Voluma is a game-changing filler product which is placed deep under the skin resulting in volumizing, lifting and contouring cheeks, cheekbones, and the jaw line.